Meg Says: The Best Beauty Advent Calendars That Are Still In Stock! 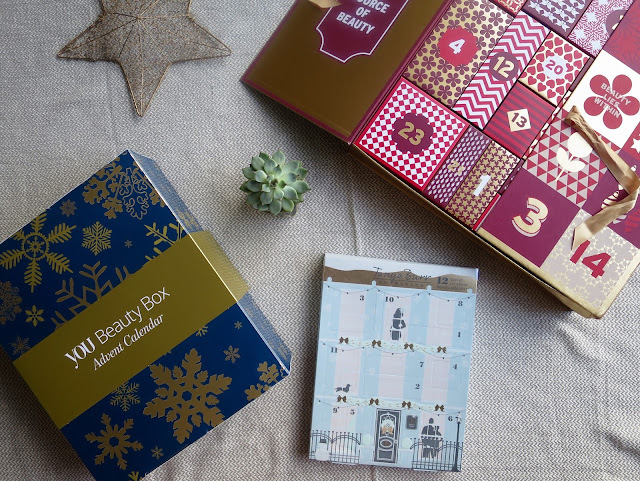 The Best Beauty Advent Calendars That Are Still In Stock! Does anyone else cringe slightly when they hear the words 'advent calendar chocolate'? Well, advent calendars have certainly come a long way since we were nippers; we waved goodbye to those stale chocolate novelty ones in favour of 'posh chocolate shop' versions, and in the last few years we've said hello to something truly special... the beauty advent calendar. In all honesty I would've chosen a beauty advent calendar over my various Disney ones even as a child, and it's a concept I can't believe wasn't invented sooner. Pretty much every brand brings out their own version these days and unsurprisingly they sell like hotcakes, so I've rounded up the best of the best that are still in stock and available to buy. Nearly all of the following have major discounts as today is Cyber Monday, so don't hesitate! The first on my list is the You Beauty Box YOU Advent Calendar as it's packed full of my favourite brands and covers every base from an on-trend eyeshadow palette to an Oskia face mask and a festive candle from The White Company. I've had a look through the products within this year's selection and there's honestly nothing in there that I wouldn't use - every single item is something I've either wanted to try for ages or am really intrigued by and want to open right this second, so for me it really is a must-have that stands out from the crowd. With its contents adding up to a whopping £270, it's definitely one of the best value calendars on the market this year and to make it even sweeter, you can get 25% off until the 30th November with the code 'BLACK25'. You're welcome! If you watched my Vlogmas 2015 you'll know that I opened the Tanya Burr Deck The Hauls Advent Calendar on every other day, and this year will be no exception as I managed to get my hands on the Tanya Burr 12 Days of Christmas Gift Set. Although I enjoyed opening it I found that Deck The Hauls was more suitable for younger people compared to say Tanya's new Autumn collection, so this would make the perfect early present for any YouTube-loving teen and make the run-up to Christmas Day even more fun. Including nail polishes, eye shimmers and lip glosses, the calendar is sold out in Superdrug but you can still get it from Feel Unique with 15% off - just enter code 'MAKEITMAGIC' at checkout, and there's a free Beauty Diary with any orders over £50 as well. Another Vlogmas 2015 gem I opened every day and truly loved (and you guys did too, judging by the comments section!) was by Johnny Loves Rosie and they've brought out a 2016 version of their Gold Advent Calendar. I'd never heard of a jewellery advent calendar before and the items were surprisingly wearable and well-made, nearly all pieces I'd buy and wear anyway and it was something I really grew to look forward to throughout the month of December. There were dainty little necklaces and adorable delicate bracelets with lots of tiny detailed festive charms to adorn them with, it was truly something special! You can actually still buy last year's here, and if you order this year's from River Island make sure you enter the code 'FREEDEL16' for free standard worldwide delivery. Molton Brown is one of my favourite brands and their Scented Luxuries Advent Calendar is on another level of lovely - would you just look at that gorgeous drawer design? They have so many scents in their range and I don't know about you but I'd like to try them all, so this calls to me as these mini sizes are a great way of finding out which ones you like best and need in your bathroom all year round. It's pricier than the other calendars I've mentioned so far but as a premium brand it's a lavish way to start every day, and they're offering 25% off with code 'UKBF25'. Do check out their limited edition Christmas range - I'm obsessed with Rosa Absolute and Fabled Juniper Berries & Lapp Pine. If you're a Soap & Glory fan then you'll love The Vintage Cosmetic Company Luxury Beauty Advent Calendar as it's jam-packed full of cutesy items like gold eyelash curlers and kitsch shower caps. For just over £20 you can get the 7 Days of Clinique Advent Calendar and for just under £30 there's the Benefit Girl O'Clock Rock. The Makeup Revolution Beauty Advent Calendar is such good value for money anyway let alone now that it has £10 off, and the Technic 12 Days of Xmas Advent Calendar is half price. Amazingly the Charlotte Tilbury World of Legendary Parties Advent Calendar is still in stock! Try as I might I couldn't find a discount code for you guys, but I'd definitely recommend snapping one up as The Tilbs always smashes it out of the park and you won't be disappointed with the goodies you'll find inside. Last but not least there's something for the men in your life - the Clarins Men 12 Days of Christmas Set - and quite rightly too, as there aren't enough of these on the market and I'm really tempted to get one for Will. Have you got a beauty advent calendar this year? Roll on December so we can start opening!